Andreas Oberheitmann is Professor for Business Administration and International Management at FOM University of Applied Sciences at the German-Sino School of Business and Technology and Scientific Director of the German-Sino Competence Center of Business & Technology. Prof. Oberheitmann is Senior Visting Research Fellow at the RWI – Leibniz Institute for Economic Research, Essen (Germany). He is Member of the Editorial Board of the American Journal of Climate Change and was expert reviewer for the Fifth Assessment Report of the Intergovernmental Panel on Climate Change (IPCC), Working Group III. Between 2007 and 2013, he was International Director of the Research Center for International Environmental Policy and Visiting Professor at the School of Environment of Tsinghua University in Beijing. Between 1993 and 2015, he was Senior Research Fellow at the RWI – Leibniz Institute for Economic Research, Essen. On 1 November 2018, CWR was invited to attend an international workshop on “Climate Change and Human Responses” in Hong Kong. One of the speakers, Professor Andreas Oberheitmann from FOM University of Applied Sciences gave a presentation on “Challenges of Climate Change for Coastal Regions and Cities: the case of China” and exploring how low carbon cities initiatives could mitigate the impacts of climate change in the country. 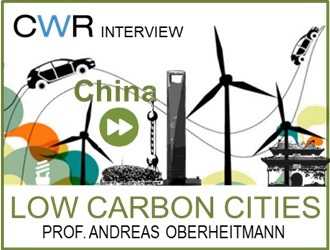 After the event, CWR had the opportunity to sit down with Prof. Oberheitmann to ask him more about this topic – what progress have China’s low carbon city pilots made and how far could they go? China Water Risk (CWR): Intergovernmental Panel on Climate Change (IPCC) just released its new report in October 2018. As one of the expert reviewers for the Fifth Assessment Report, how do you view the stark warning about the impact of 1.5ºC from the new report, especially for China? Prof. Andreas Oberheitmann (AO): The already existing impacts of climate change, e.g. the constantly increasing smelting of glaciers and Arctic and Antarctic ice shields, are showing us that the envisaged 1.5ºC is absolutely crucial to keep the negative impacts of climate change in an order of magnitude providing future generations a liveable planet. For China, low elevated coastal cities such as Hong Kong and Guangdong will be threatened by sea level rise if the 1.5ºC or 2ºC goal cannot be held. Below 2°C, until 2100, global sea level rise may be up to 1.2 m compared to pre-industrial times. In IPCC scenarios between 2-4°C global warming, sea level may rise up to 7 m in 2100 and beyond. Not to mention that China’s urbanisation rate is increasing. In 2015, it was 56%. For 2030, the McKinsey Global Institute is estimating 1 billion citizens with an urbanisation rate of 70%. This means more population will be exposed to the negative impacts of climate change. CWR: To tackle climate change, China has launched 42 low carbon city pilots since 2010. Can you share some of the successful case studies and challenges faced so far? AO: In China, urban areas cover less than 1% of the countries surface, but 85% of Chinese GDP is generated in cities, 90% of the Chinese service industry is located in cities and 75% of the total Chinese energy use is consumed in cities. Hence cities are both main source of greenhouse gas emissions and also focus of negative impacts of climate change. To mitigate climate change on a local level, in 2016: 6 provinces and 36 cities in China were selected as official low carbon city pilot areas, i.e., most provinces have at least one pilot city. Besides these pilot cities, a number of Chinese cities have also taken construction of low-carbon city into practice with different focuses (overall low-carbon targets and planning, low-carbon management, some low-carbon demonstration areas etc.). Low carbon management: Seven cities and provinces (Beijing, Tianjin, Shanghai, Chongqing, Guangdong, Hubei and Shenzhen) are carrying out pilot carbon emission trading. Guangdong first hold a carbon auction for permit quotas. Low-carbon demonstrative areas: Tianjin low carbon demonstrative area cooperated by Chinese and Japanese cities in which new energy, green building, and green transportation will be mainly developed. Chongming Dongtan Eco-city in Shanghai was fully designed from urban planning, sustainable energy, green building, and green transportation, and is hopeful to become the first carbon-neutral area in the world. Sustainable energy systems: Baoding City is establishing an Electricity Valley including wind power, electricity saving, electricity storage etc. Ecological industry: Zhuhai City regulated its industrial structure to strengthen the high-end service industry, advanced manufacturing industry, and high-tech industry. Wuxi City has become the biggest production and export base of photovoltaic industry in China, where many manufacturers and related industries were clustered. Green Transportation: In Hangzhou City, green public transportation will be developed with priority including subway, electric bus and taxis, public bicycles, and water busses. Taiyuan City is the first Chinese City with 100% electric taxis. Green buildings: In Wuxi City, green buildings are greatly promoted by multiple supporting policies, energy saving technologies, and projects. In Tianjin City, it takes green buildings as the basic unit to build low-carbon parks and low-carbon communities and sets evaluation standards of green construction. It refers to multiple international standards being more stringent than the national standards. Low carbon life style: In 2015, NDRC released the guideline on construction of low carbon pilot community, emphasising low-carbon life for existing and urban newly-built urban and rural communities including aspects of low-carbon culture, low-carbon consumption and low-carbon interior decoration. For low-carbon consumption, Guangdong City and Chongqing City implemented low-carbon product certification trials. Reportedly, the performance of the low carbon city approaches is regionally different. Among all, Shenzhen, Beijing, Guangzhou, and Shanghai are ranked in the first with a relatively high low-carbon development while Chongqing, Kunming, Suzhou, and Baoding are ranked a relatively low low-carbon development level. Zhuhai, Qingdao, Hangzhou, and Tianjin are ranked in the middle. CWR: In your presentation, you mentioned that Wuxi city stands out among the low carbon city pilots, can you tell us why? AO: The Wuxi low carbon city initiative is aiming at reducing CO2-intensity of Gross Value Added by 50% in 2020 compared to 2005. This pledge is going beyond the national goal of a 40-45% reduction of CO2-intensity of GDP in 2020. It is following a more holistic approach by mitigating climate change in different sectors such as agriculture, industry and households. Most of the CO2-emission reduction is through changes in the economic structure away from carbon intensive heavy industries to light industry and services. Important success factor of low carbon city approaches in China, such as Wuxi City, show the political will of the local government to make real changes. CWR: We have heard many views from the conference on climate change and opportunities for Hong Kong. In your view, do you think Hong Kong has potential to adopt China’s low carbon city initiative? AO: Hong Kong has the potential to adapt low carbon city measures as the city is constantly modernising and the people are willing to adapt to a low carbon lifestyle. For instance, most of the taxis in Hong Kong are already running on LPG and electricity. However, low carbon transportation is only sustainable, if power generation is not fuelled by fossil sources, but renewable energies such as off-shore wind energy. Otherwise, the source of CO2-emissions is only switched from cars to power stations. In the building sector, insulation of the outer walls should be improved to save energy for cooling. Also, energy efficiency of the air-conditioning devices still can be increased. The same is true for energy efficiency in power generation in general. In the long-term, however, power generation should be replaced entirely by central and de-central renewable energies. For example, de-central photo-voltaic energy use in households can be massively increased. CWR: Lastly, what are your suggestions for current low carbon city pilots in China and what likely transformations can you see for the future? AO: Low carbon cities in China need an integrated approach that considers mitigation, adaptation and urban development. The improvement of city services is related to the ability of cities to adapt to climate change and reduce their greenhouse gas emissions. Cities with excellent services are generally resilient cities, especially advanced dam and drainage systems can alleviate flooding during intense storms, healthcare services are equipped to respond to emergency situations and warning systems and transportation infrastructure allow citizens to evacuate in response to risk. There is also scope to combine low carbon city with smart city approaches and utilising the digitalisation of the society and economy for climate change mitigation purposes.